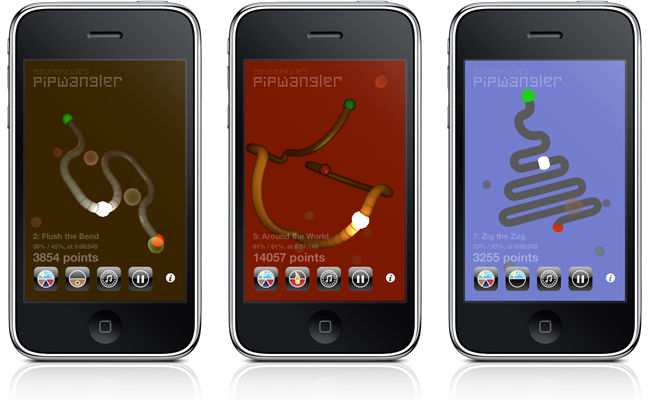 Mousepickle’s new app, Pip Wangler, was released just in time for Christmas 2012. It’s a tricky 3D puzzle game that pits your wits and dexterity against a series of bendy Wangle Wires. Can you get the Pip to slide from one end to the other quickly enough? You can read more about Pip Wangler, and see brief instructions on how to use it. Some technical details of the application’s implementation are also available. As always we’ve gratefully received help with testing, some unvarnished feedback, and a little commercial guidance from fellow developers. Discussions with Mr Chay about the sounds were particularly useful.